Just a reminder to set your clocks back an hour Saturday night — especially if you're planning to go on the First Sunday walk this weekend. 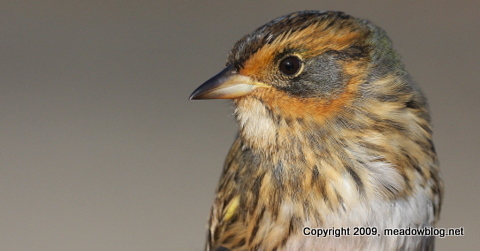 The DeKorte walk begins at 10 a.m., and birders arrive early enough as it is. Sunday, December 13, 10 a.m. 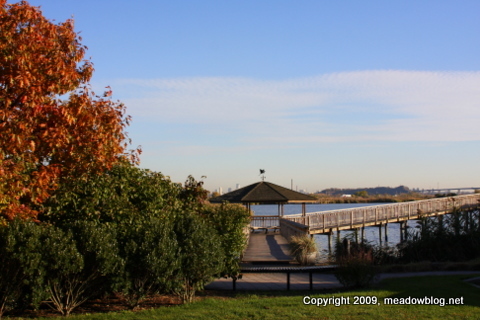 This free two-hour walk starts at the entrance to the Mill Creek Marsh in Secaucus. We’ll look for winter raptors, waterfowl and other birds in this 225-acre natural area. The Meadowlands Commission restored the site and opened it to the public in 2002. It is a great place to watch birds, take a walk, or just chill. To rsvp, contact Don Torino of the BCAS at greatauk4@aol.com or 201-636-4022. Directions to Mill Creek Mall are available here; the marsh is on the north side of the mall. NJMC Naturalist Mike Newhouse banded this beauty yesterday. Who is he? Click "Continue reading…" for the answer and more about this bird.